Emma Thompson is a famous British actress who gained the world’s recognition after the movie “The Tall Guy” and series “Fortunes of War” and “Tutti Frutti” were released. The actress has been an Oscar laureate twice: for the movies “Howards End” and “Sense and Sensibility”; she also won the Emmy Award for the TV series “Ellen.” British movie lovers consider Emma to be a classic actress of the present days. Emma spent her childhood in West Hampstead, North-West London. She went to the Cadman school for girls and visited her grandparents on the mother’s side in the Scottish village Ardentinny on summer. As a teenager, Thompson was fond of the English literature and dreamed of becoming a writer. When the girl finished school, she entered the Newnham College, University of Cambridge, where she studied philology. However, as the actress noticed later, because she was brought up in Phyllida and Eric’s family, there was not a single chance of joining any other profession except for acting. During the Cambridge period, Emma became the member of the Footlights troupe where many popular comedians used to work. The young woman started developing her talent to make people laugh and took comic roles. At that time, she became a convinced feminist and had her hair cut short and dyed red. Riding a bike at high speed was her favorite activity. By the way, the expressive lady became the first female member of the Footlights which marks her talent and determination. Emma Thompson, Stephen Fry, and Hugh Laurie made a gorgeous trio in the troupe; thanks to this activity, she turned into the leading actress of the theater. For that moment, Thompson was satisfied with half-amateurish performances. However, when her father died a sudden death in 1982, Emma was deeply engrossed in work as the part of her coping mechanism. In several years, she became one of the most promising and perspective actresses of London. She took part in Shakespeare’s plays and appeared on TV in humorous sketches. It was Thompson who created and organized the high-ranking comedian program “Alfresco.” She also tried herself as an actress in BBC historic series. The TV comedy “There is Nothing to Worry About!” was the first movie where Emma Thompson was offered a role; similar comedy projects followed. The actress became famous due to the comedy “Tutti Frutti” and military drama “Fortunes of War.” In Britain, the light melodrama “The Tall Guy” where Emma played Kate Lemmon, an extravagant nurse, was also popular. Thompson got the global recognition after the historic movie “Howards End” and social love drama “The Remains of the Day” with Anthony Hopkins. At the same time, the biographical movie “In the Name of the Father” was sparked furor. These three projects resulted in prestigious movie awards nominations; “Howards End” brought the Academy Award and the Golden Globe. Foreign studios started offering the actress new roles. In Hollywood, Thompson starred with Arnold Schwarzenegger and Danny DeVito in the comedy “Junior” and collaborated with Antonio Banderas in the thriller “Imagining Argentina.” In the political tragicomedy “Primary Colors”, the actress played the wife of the US President (John Travolta); four countries worked on this project. The actress’s childhood dream to become a writer came true: Emma created the scenario for Jane Austen’s “Sense and Sensibility” and won the Academy Award for Best Original Screenplay. This talented woman continued writing and worked on the scenario for the family fantasy comedy “Nanny McPhee,” although it took her nine years to turn the idea into a final piece of art. The movie was a success. Thompson also starred in this project together with Angela Lansbury and Colin Firth. Emma Thompson took part in creating the scenario for the screen adaptation of Jane Austen’s “Pride and Prejudice” by Joe Wright. The Hollywood star Kira Knightley took the leading part in this movie. The scenario for the drama “Effie Gray” was another achievement in Emma Thompson’s career; she also starred there as the writer Lady Eastlake. Dakota Fanning and Greg Wise also participated in this project. The movie was released in 2014. Just like many leading British actors in the 21st century, the actress appeared in the popular saga about a boy magician “Harry Potter.” For the first time, Emma starred in the third movie “Harry Potter and the Prisoner of Azkaban” as the eccentric divination teacher, Professor Sybill Trelawney. Although the movie saga is extremely popular and Thompson’s role was almost comic, the actress was not satisfied with the results of her work. She said it was boring to play this character because the directors and producers did not allow her to bring something special which could have turned Sybill Trelawney into a diamond. Despite this experience, the actress participated in another fantasy project, the melodrama “Beautiful Creatures,” where Emma played two characters: the main character Lena’s (Alice Englert) mother and Lincoln’s (Thomas Mann) mother. In Britain, working on Evelyn Waugh’s classic drama “Brideshead Revisited” and melodrama “Last Chance Harvey” with Dustin Hoffman gave Thompson much pleasure. The actress has also worked in the duos with Pierce Brosnan in the comedy “The Love Punch” and Tom Hanks in the biographical tragicomedy “Saving Mr. Banks.” In the latter project, the actress had the role of the English writer Pamela Travers, the author of Mary Poppins tales. Her work was so fascinating that all her colleagues were sure she would win the Academy Award for the Best Actress. The news was shocking: Thompson was not even included in the shortlist. Among the latest work, the crime comedy “The Legend of Barney Thomson” and the military drama “Alone in Berlin” stand out. In 2016, the third part of the melodramatic “Bridget Jones’s Diary” was finished. Emma Thompson worked on the movie scenario. The comedy tells the story of 43-year-old Bridget who still has no family. At this time, she manages to get into the car of the last train; she gets pregnant. However, the situation is complicated by two father candidates. Renée Zellweger, Patrick Dempsey, and Colin Firth played the main characters; Emma Thompson appeared as a gynecologist. In the late 1970s, the beginning actress started dating the Footlights partner Hugh Laurie. Their relationship lasted for about four years. Despite the breakup, the actors remain good friends now. Soon, Emma met the actor and director Kenneth Branagh. The couple worked together on six movies but tried to avoid shedding light on their relationship and did not want the audience to view them as “a golden couple.” In 1995, the marriage resulted in a deadlock: Kenneth and Emma divorced. In the course of time, Thompson admitted she was depressed after she split up with her husband. She threw herself into work on the movie “Sense and Sensibility.” At the movie set, she met a young actor Greg Wise who was seven years younger than Emma. As the actress said, the new love and interesting project helped her restore her energy. When Emma was 39, she gave birth to a daughter Gaia. Four years after the girl was born, Thompson married the father of her child. The ceremony took place in the Scottish town Dunoon where Emma had a house of her own. In the same year, the couple adopted a 16-year-old boy Tindyebwa Agaba, a refugee from Rwanda, East Africa. His entire family died because of the genocide, and he had to flee in Great Britain. Although Emma was brought up according to the religious morality, she stopped going to church early. When the girl was talking to a pastor, she asked if her gay uncle was going to go to heaven. As she received no for the answer, young Thompson decided that she had nothing to do in heaven if the kindest and most helpful person she knew was not allowed there. The woman lives according to Christian ethical principles but does not belong to this faith. 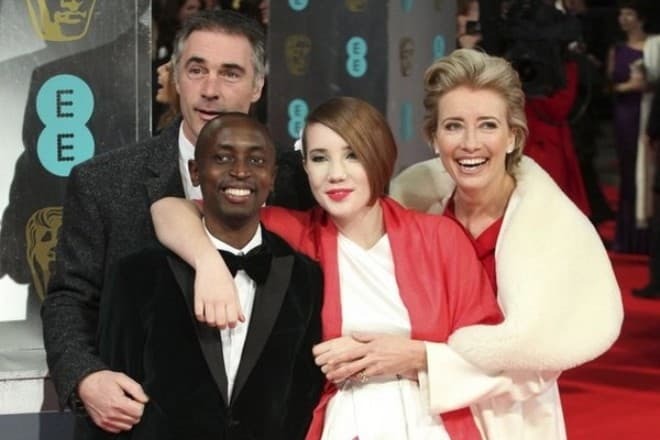 Emma Thompson is one of those actresses who earn their fame with their works, not blogs on social networks. However, Instagram pages of her fans publish her photos from time to time. In 2017, Thomson starred in the long-awaited movie version of the Disney musical tale “Beauty and the Beast” – she played the charmed housekeeper Mrs. Potts. The movie also starred Emma Watson, Luke Evans, Ian McKellen, and other top stars. The success of the project has been proved by the box office - $1.2 billion. It is the highest grossing musical in the history of the cinematography. The movie brought its creators many awards. Emma Thompson won MTV Movie & TV Awards and Teen Choice Award. In the same year, Emma got the leading part in the American tragicomedy “The Meyerowitz Stories” that was nominated for Palme d'Or at the Cannes Film Festival. The actress also played the main character in the drama The Children Act. In 2018, the premiere of the British adventure comedy “Johnny English Strikes Again” with Emma Thompson is scheduled. The main character is played by Rowan Atkinson. The actress is going to take up creating the theater adaptation scenario of the movie “Nanny McPhee.” She said that the first act of the play was finished, and the whole scenario of the musical would have been written in six months.